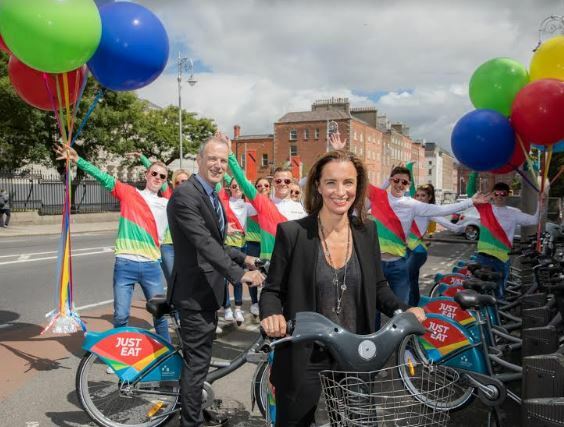 JustEat and dublinbikes are today celebrating the rollout of 1,500 JustEat branded dublinbikes across Dublin. The justEat logo and signature colour ray can be found on all of these new bikes. The docking station screens, service vehicles, staff uniforms and associated inventory have all been branded with the JustEat logo and colours. Just like Willy Wonka’s golden tickets, 10€ JustEat vouchers have been placed randomly in dublinbikes baskets at the stations. A total of 5000€ has been spent by JustEat for this Marketing campaign. Figures published in June show there are 68,883 long term members of the scheme and since 2009 there have been 19,811,383 journeys. 96% of all journeys taken are completely free and the average journey time for users is just 15 minutes. Every single new bike was washed and cleaned by young people from Ballymun Kickhams, the well known Dublin based GAA club. The effort of these young people from the club, working in partnership with the JCDecaux team members, helped support the mammoth task of getting all the newly branded bikes on street and fully operational today. 15 new stations and 100 new bikes will be added to the Dublinbikes scheme for the expansion in Grangegorman. JustEat and dublinbikes ask users who find gift cards in the baskets to please share pictures on social media with the #JustEatdublinbikes. The best pictures will be rewarded some more gift cards!